East central Oklahoma, Creek and Seminole, south Alabama Creek, Florida, Seminole of Brighton Reservation. The Muscogee language (Muskogee, Mvskoke IPA: [maskókî] in Muscogee), also known as Creek, is a Muskogean language spoken by Muscogee (Creek) and Seminole people, primarily in the U.S. states of Oklahoma and Florida. Along with Mikasuki, when spoken by the Seminole it is known as Seminole. Historically the language was spoken by various constituent groups of the Muscogee or Maskoki in what are now Alabama and Georgia. It is related to but not mutually intelligible with the other primary language of the Muscogee confederacy, Hitchiti/Miccosukee, spoken by the kindred Miccosukee (Mikasuki), as well as other Muskogean languages. The Muscogee first brought the Muscogee and Miccosukee languages to Florida in the early 18th century and would eventually become known as the Seminoles. In the 19th century, however, the US government forced most Muscogees and Seminoles to relocate west of the Mississippi River, with many forced into Indian Territory. Today, the language is spoken by around 5000 people, most of whom live in Oklahoma and are members of the Muscogee (Creek) Nation and the Seminole Nation of Oklahoma. Around 200 speakers are Florida Seminoles. Seminole use of the language constitutes distinct dialects. Creek is widely spoken amongst the Creeks, and the Muscogee Nation offers free language classes and immersion camps to Creek children. The College of the Muscogee Nation offers a language certificate program. Tulsa public schools, the University of Oklahoma and Glenpool Library in Tulsa and the Holdenville, Okmulgee, and Tulsa Creek Indian Communities of the Muscogee (Creek) Nation offer Muskogee Creek language classes. In 2013, the Sapulpa Creek Community Center graduated a class of 14 from its Muscogee language class. The phoneme inventory of Muscogee consists of thirteen consonants and three vowel qualities, which distinguish length and nasalization. It also makes use of the gemination of plosives, fricatives and sonorants. There are four voiceless plosives in Creek: /p t t͡ʃ k/. /t͡ʃ/ is a voiceless palatal affricate and patterns as a single consonant and so with the other voiceless stops. /t͡ʃ/ has an alveolar allophone [t͡s] before /k/. The obstruent consonants /p t t͡ʃ k/ are voiced to [b d d͡ʒ ɡ] between sonorants and vowels but remain voiceless at the end of a syllable. There are four voiceless fricatives in Muscogee Creek: /f s ɬ h/. /f/ can be realized as either labiodental ([f]) or bilabial [ɸ] in place of articulation. Predominantly among speakers in Florida, the articulation of /s/ is more laminal, resulting in /s/ being realized as [ʃ], but for most speakers, /s/ is a voiceless apico-alveolar fricative [s]. The sonorants in Muscogee are two nasals (/m/ and /n/), two semivowels (/w/ and /j/), and the lateral /l/, all voiced. Nasal assimilation occurs in Creek: /n/ becomes [ŋ] before /k/. All plosives and fricatives in Muscogee can be geminated (lengthened). Some sonorants may also be geminated, but [hh] and [mm] are less common than other sonorant geminates, especially in roots. For the majority of speakers, except for those influenced by the Alabama or Koasati languages, the geminate [ww] does not occur. The three short vowels /i ɑ o/ can be realized as the lax and centralized ([ɪ ə ʊ]) when a neighboring consonant is coronal or in closed syllables. However, /ɑ/ will generally not centralize when it is followed by /h/ or /k/ in the same syllable, and /o/ will generally remain noncentral if it is word-final. Initial vowels can be deleted in Creek, mostly applying to the vowel /i/. The deletion will affect the pitch of the following syllable by creating a higher-than-expected pitch on the new initial syllable. Furthermore, initial vowel deletion in the case of single-morpheme, short words such as ifa 'dog' or icó 'deer' is impossible, as the shortest a Creek word can be is a one-syllable word ending in a long vowel (fóː 'bee') or a two-syllable word ending with a short vowel (ací 'corn'). There are three long vowels in Muscogee Creek (/iː ɑː oː/), which are slightly longer than short vowels and are never centralized. In Muscogee, there are three diphthongs, generally realized as [əɪ ʊj əʊ]. Both long and short vowels can be nasalized (the distinction between acces and ącces below), but long nasal vowels are more common. Nasal vowels usually appear as a result of a contraction, as the result of a neighboring nasal consonant, or as the result of nasalizing grade, a grammatical ablaut, which indicates intensification through lengthening and nasalization of a vowel (likoth- 'warm' with the nasalizing grade intensifies the word to likŏ:nth-os-i: 'nice and warm'). Nasal vowels may also appear as part of a suffix that indicates a question (o:sk-ihá:n 'I wonder if it's raining'). There are three phonemic tones in Muscogee; they are generally unmarked except in the linguistic orthography: high (marked in the linguistic orthography with an acute accent: á, etc. ), low (unmarked: a, etc. ), and falling (marked with a circumflex: â, etc.). Bilingual stop sign in English and Creek, in Okmulgee, Oklahoma. The traditional Muscogee alphabet was adopted by the tribe in the late 1800s and has 20 letters. r ɬ a sound that does not occur in English but is often represented as "hl" or "thl" in non-Creek texts. The sound is made by blowing air around the sides of the tongue while pronouncing English l and is identical to Welsh ll. In addition, certain combinations of consonants sound differently from English, giving multiple possible transcriptions. The most prominent case is the second person singular ending for verbs. 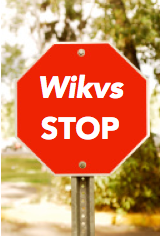 Wiketv means "to stop:" the verb for "you are stopping" may be written in Creek as wikeckes or wiketskes. Both are pronounced the same. The -eck- transliteration is preferred by Innes (2004), and the -etsk- transliteration has been used by Martin (2000) and Loughridge (1964). However, the correspondences do not always apply, and in some words, short /a/ is spelled a, long /iː/ is spelled e, and short /o/ is spelled o. Falling tone in a syllable is shown using a circumflex. In English, falling tone is found in phrases such as "uh-oh" or commands such as "stop!" In Muscogee, however, changing a verb such as acces ("she is putting on (a dress)") to âcces alters the meaning from one of process to one of state ("she is wearing (a dress)"). Nasalization of a vowel is shown with an ogonek under the vowel. Changing the verb acces to ącces adds the imperfective aspect, a sense of repeated or habitual action ("she kept putting on (that same dress)"). The key syllable of a word is often shown with an accent and is the last syllable that has normal (high) tone within a word; the following syllables are all lower in pitch. The general sentence structure fits the pattern subject–object–verb. The subject or object may be a noun or a noun followed by one or more adjectives. Adverbs tend to occur either at the beginning of the sentence (for time adverbs) or immediately before the verb (for manner adverbs). Case is marked on noun phrases using the clitics -t for subjects, and -n for non-subjects. The clitic -n can appear on multiple noun phrases in a single sentence at once, such as the direct object, indirect object, and adverbial nouns. Despite the distinction in verbal affixes between the agent and patient of the verb, the clitic -t marks subject of both transitive and intransitive verbs. In some situations, case marking is omitted. This is especially true of sentences with only one noun where the role of the noun is obvious from the personal marking on the verb. Case marking is also omitted on fixed phrases that use a noun, e.g. "go to town" or "build a fire". Person of agent. Letketv = to run. Lētkis. = I am running. Lētketskes. = You are running. Lētkes. = He / She is running. Plural forms can be a bit more complicated (see below). Person of patient and/or indirect object. That is accomplished with prefixes. Hecetv = to see. Cehēcis = I see you. Cvhēcetskes. = You see me. Tense. Pohetv = to hear. Pohis. = I am hearing (present). Pohhis. = I just heard (first or immediate past; within a day ago). Pohvhanis. = I am going to hear. Pohares. = I will hear. Pohiyvnks. = I heard recently (second or middle past, within a week ago). Pohimvts. = I heard (third or distant past, within a year ago). Pohicatēs. = Long ago I heard (fourth or remote past, beyond a year ago). There are at least ten more tenses, including perfect versions of the above, as well as future, indefinite, and pluperfect. Mood. Wiketv = to stop. Wikes. = He / She is stopping (indicative). Wike wites. = He / She may stop (potential). Wiken omat. = If he / she stops (subjunctive). Wikepices. = He / She made someone stop (causative). Aspect. Kerretv = to learn. Kērris. = I am learning (progressive, ongoing or in progress). Kêrris. = I know (resulting state). Kęrris. = I keep learning (imperfect, habitual or repeated action). Kerîyis. = I just learned (action completed in the past). Wihkis. = I just stopped (active voice, 1st past). Cvwihokes. = I was just stopped (passive voice, 1st past). Wikarēs. = I will stop (positive, future tense). Wikakarēs. = I will not stop (negative, future tense). Questions. Hompetv = to eat; nake = what. Hompetskes. = You are eating. Some Muscogee verbs, especially those involving motion, have highly irregular plurals: letketv = to run, with a singular subject, but tokorketv = to run of two subjects and pefatketv = to run of three or more. enokkē = to be sick; enokkēs = he / she is sick; cvnokkēs = I'm sick; cenokkēs = you are sick. Example: vyetv = to go (singular subjects only, see above); ayes = I am going; ak-ayes = I am going (in water / in a low place / under something); tak-ayes = I am going (on the ground); oh-ayes = I am going (on top of something). However, for verbs of motion, Muscogee has a large selection of verbs with a specific meaning: ossetv = to go out; ropottetv = to go through. Clauses in a sentence use switch-reference clitics to co-ordinate their subjects. The clitic -t on a verb in a clause marks that the verb's subject is the same as that of the next clause. The clitic -n marks that verb's subject is different from the next clause. In some languages, a special form of the noun, the genitive case, is used to show possession. In Muscogee this relationship is expressed in two quite different ways, depending on the nature of the noun. Even if the possessor is mentioned specifically, the prefix still must be part of the word: Toskē enke = Toske's hand. It is not redundant in Muscogee ("Toske his_hand"). All other nouns are possessed through a separate set of pronouns. pum efv = our dog. Again, even though the construction in English would be redundant, the proper way to form the possessive in Muscogee must include the correct preposition: Toskē em efv = Toske's dog. That is grammatically correct in Muscogee, unlike the literal English translation "Toske his dog". A final distinctive feature, related to the above, is the existence of locational nouns. In English, speakers have prepositions to indicate location, for example, behind, around, beside, and so on. In Muscogee, the locations are actually nouns. These are possessed just like parts of the body and family members were above. cuko = house; yopv = noun for "behind"; cuko yopv = behind the house; cvyopv = behind me; ceyopv = behind you. lecv = under; eto = tree; eto lecv = under the tree. tempe = near; cvtempe = near me; cetempe = near you; putempe = near us. The forms of Muscogee used by the Seminole of Oklahoma and Florida are separate dialects from the ones spoken by Muscogee people. 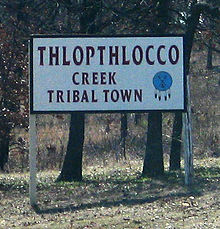 Oklahoma Seminole speak a dialect known as Oklahoma Seminole Creek. Florida Seminole Creek is one of two languages spoken among Florida Seminoles; it is less common than the Miccosukee language. Brown, Keith, and Sarah Ogilvie (2008). Concise encyclopedia of languages of the world, pp. 738–740. Elsevier. Retrieved September 27, 2011. Haas, Mary R. and James H. Hill. 2014. Creek (Muskogee) Texts. Edited and translated by Jack B. Martin, Margaret McKane Mauldin, and Juanita McGirt. UC Publications in Linguistics. Berkeley: University of California Press. Hardy, Donald E. (2005). "Creek". In Hardy, Heather K.; Scancarelli, Janine (eds.). Native Languages of the Southeastern United States. Lincoln, NE: University of Nebraska Press. pp. 200–245. ISBN 0803242352. Johnson, Keith; Martin, Jack (2001). "Acoustic Vowel Reduction in Creek: Effects of Distinctive Length and Position in the Word" (PDF). Phonetica. 58 (1–2): 81–102. doi:10.1159/000028489. PMID 11096370. Archived from the original (PDF) on 2010-06-26. Retrieved 2009-04-26. Innes, Pamela; Linda Alexander; Bertha Tilkens (2004). Beginning Creek: Mvskoke Emponvkv. Norman, OK: University of Oklahoma Press. ISBN 0-8061-3583-2. Loughridge, R.M. ; David M. Hodge (1964). Dictionary Muskogee and English. Okmulgee, OK: Baptist Home Mission Board. Martin, Jack B. (2011). A Grammar of Creek (Muskogee). Lincoln, NE: University of Nebraska Press. ISBN 9780803211063. Martin, Jack B.; Margaret McKane Maudlin (2000). A Dictionary of Creek/Muskogee. Lincoln, NE: University of Nebraska Press. ISBN 0-8032-8302-4. ^ Hammarström, Harald; Forkel, Robert; Haspelmath, Martin, eds. (2017). "Creek". Glottolog 3.0. Jena, Germany: Max Planck Institute for the Science of Human History. ^ "About Creek". Creek Language Archive. Archived from the original on 2009-06-09. Retrieved 2009-04-26. ^ a b Brown, Keith, and Sarah Ogilvie (2008). Concise encyclopedia of languages of the world, pp. 738–740. Elsevier. Retrieved September 27, 2011. ^ Pratt, Stacey (2013-04-15). "Language vital part of cultural identity". Tahlequah Daily Press. Retrieved 2013-04-17. ^ Brock, John (2013-08-17). "Creek language class graduates 14". Sapulpa Herald Online. Sapulpa, Oklahoma. Archived from the original on 2013-08-23. Retrieved 2013-08-23. ^ Saunt, Claudio (1999). A New Order of Things. Property, Power, and the Transformation of the Creek Indians, 1733–1810. Cambridge University Press. ISBN 0521660432. ^ "Haas/Hill texts - Muskogee (Seminole/Creek) Documentation Project". Muskogee (Seminole/Creek) Documentation Project. Retrieved 2017-12-22. Wikisource has the text of an 1879 American Cyclopædia article about Muscogee language. The Creek Language Archive. This site includes a draft of a Creek textbook, which may be downloaded in .pdf format (Pum Opunvkv, Pun Yvhiketv, Pun Fulletv: Our Language, Our Songs, Our Ways by Margaret Mauldin, Jack Martin, and Gloria McCarty). This page was last edited on 31 March 2019, at 15:55 (UTC).